This topic explains how to create a new icon in a solution and how to work on it in IconWorkshop using the Visual Studio plug-in (read the plug-in introduction). This feature is available for Visual Studio 2005, 2008, 2010 & 2012 only. Prior versions of Visual Studio do not support the add-in. 1. Launch the Visual Studio IDE. 2. Open a solution. In the solution explorer, double-click on the resource file (extension .RC). The Resource Explorer opens. 3. The Resource View window opens. In the resource tree, right click on the Icon folder and choose "Insert Icon". 4. A new icon (say its name is "IDI_ICON1" and the icon filename is "icon1.ico") is added to the solution and automatically opened in a document window. It contains only 2 newly created formats 16x16 and 32x32 in 16 colors. Open it in IconWorkshop by choosing "Tools/Edit in IconWorkshop" or by clicking the associated button in the toolbar. If you use Visual Studio 2005, you must save the file (the associated RC file) and reload the icon file from the Solution Explorer before clicking on the plug-in button. 5. 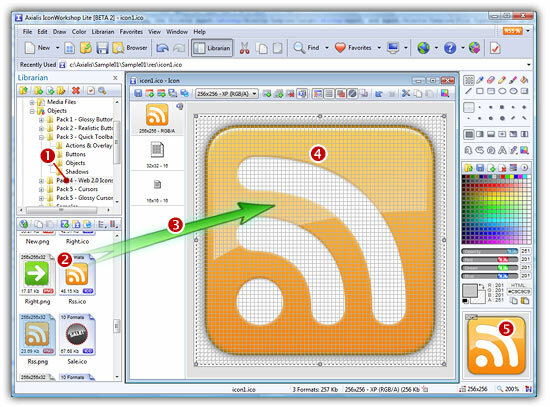 Once the file is opened in IconWorkshop, select "Draw/New Image Format" or press Ins. In this procedure, we'll make an icon fully compliant with Windows Vista but you can make icons using different specifications (read more about icons). In Colors select "RGB / Alpha Channel", in Size select "256x256 (Vista)". 6. As we want to make a Windows Vista icon, we'll compress the format in PNG: Select "PNG Compress 256x256 format". Be sure to leave the option "Creation based on the following image" unchecked. Click OK. The new 256x256 format is created. 8. Before going further, we must remove the 2 formats 32x32-16 and 16x16-16 originally created by Visual Studio. Right-click on them and choose "Remove Image Format" (the only format in the icon should be "256x256 - RGB/A"). 11. 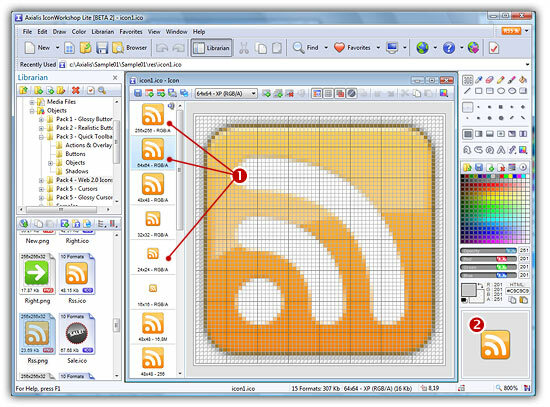 Click on the various formats ( ) and see the resulting icon at scale 1:1 in the preview window ( ). Note that the first image 256x256 RGB/A is PNG compressed because the small image is displayed in the upper-right corner. 12. Save your icon, select File/Save or press Ctrl+S. Close the document. 13. Switch back to Visual Studio. The IDE prompts you "icon1.ico - This file has been modified outside of Visual Studio. Do you want to reload it?". Click Yes. 24. You have finished. Now you can compile your project with your new icon embedded.